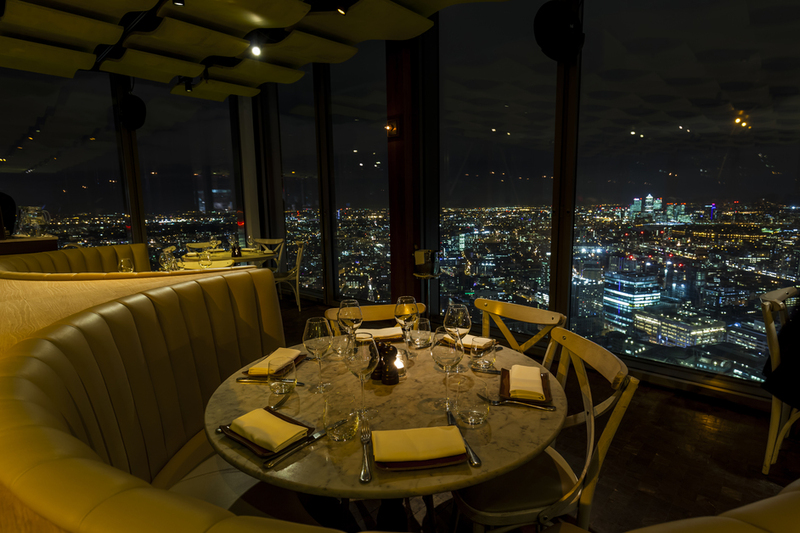 On the 40th floor of Heron Tower, Duck & Waffle offers diners spectacular views over The City and a European menu which changes throughout the day. Choose a Foie Gras 'All Day Breakfast' to start your day - quite literally 'on a high' - whilst looking out over The City's high rise towers. Alternatively, opt for the Duck &Waffle and you'll get a fried duck egg served with mustard maple syrup. An all-day menu is on offer at the stainless steel and frosted glass 98-seat restaurant with comforting choices like Old Spot pork pie with smoked quail egg, homemade Black Pudding with gooseberry chutney, bacon-wrapped dates with linguica sausage and endive salad, lamb sweetbreads, and a cheesey fourme d'Ambert tart based on an Eccles Cake. The restaurant offers a late night menu, featuring, among other dishes, roasted Galloway veal marrow bones with ox cheek marmalade, pickled girolles and parsley. The Duck & Waffle is one of two restaurants at Heron Tower which, along with SushiSamba on the 38th and 39th floors, is operated by US restaurant group Samba Brands Management. Duck & Waffle gyms, sporting activities, health & beauty and fitness. The best pubs near London Duck & Waffle. Duck & Waffle clubs, bars, cabaret nights, casinos and interesting nightlife. Where to have your meeting, conference, exhibition, private dining or training course near Duck & Waffle. From cheap budget places to stay to luxury 5 star hotels see our special offers for Duck & Waffle hotels, including 196 Bishopsgate Serviced Apartments from 85% off.